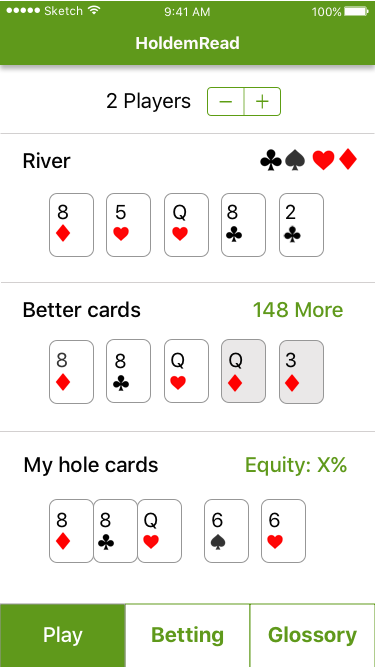 A friend and I are designing and developing an app for Texas Holdem learners and players. 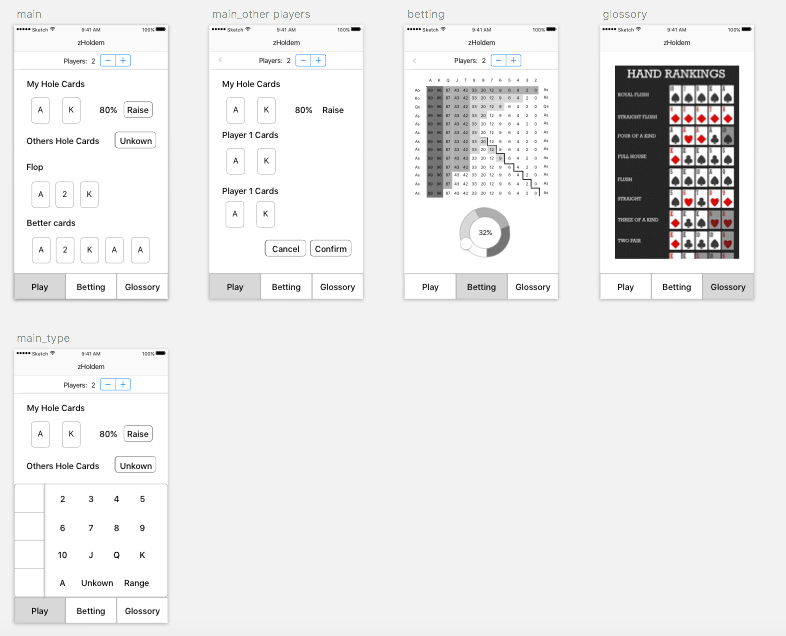 A friend (Let’s call him Z) came to me with an app prototype (see screenshot below). He said, “I want to create a Texas Holdem calculator, we could potentially work on this together”. Actually it took me some time to understand what is this prototype about. 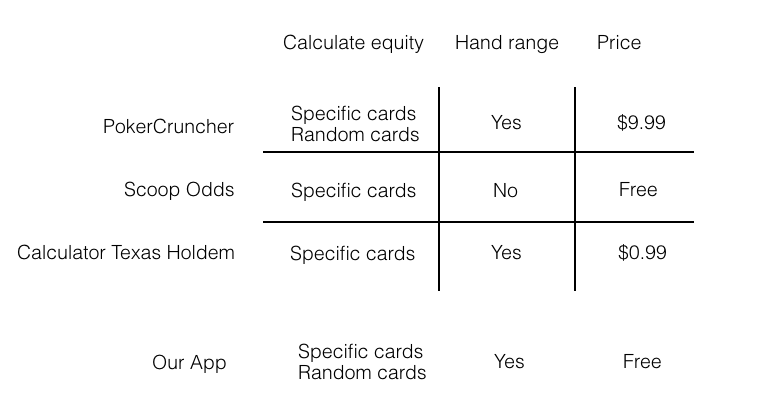 It is a table of probability to win in Texas Holdem based on known given cards (equity). I decided to first assume this is the calculator that Z wanted to build, and then test that assumption in further research. To initiate cooperation, I researched on the current prototype and drafted out several design alternatives in Sketch to illustrate to Z how we could present the data in more visualized ways or ways that better accommodate user flows (see image below). Now let’s look at the assumption again. 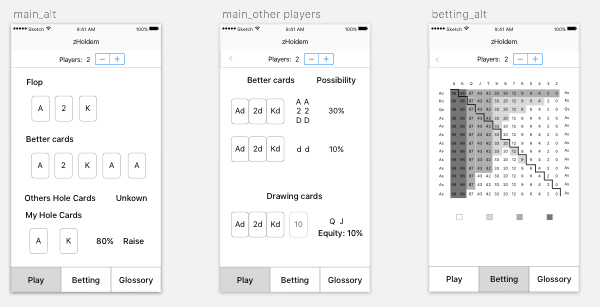 I searched “Texas Holdem calculator” on App Store, and conducted simple competitive analysis on the existing apps and our app. It seems that a lot of apps already have this functionality however most of them are very complex. So I recommended to Z, our app should be light-weight and focus more on educating entry-level players. Taking a step further, I asked Z, why do we want to build a functionality that is already there? 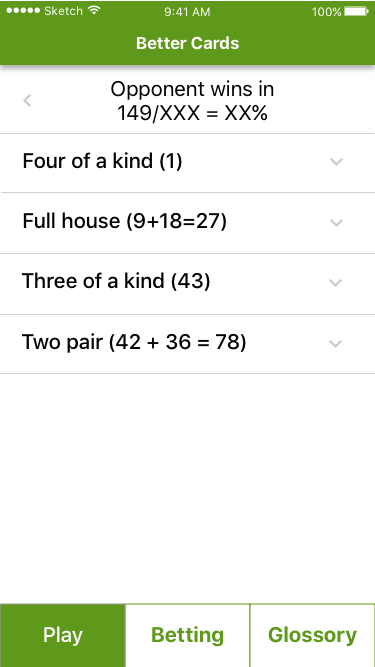 In studying one of the use cases that Z brought up, we realized that “Texas Holdem calculator” is not the exact thing we want to build. 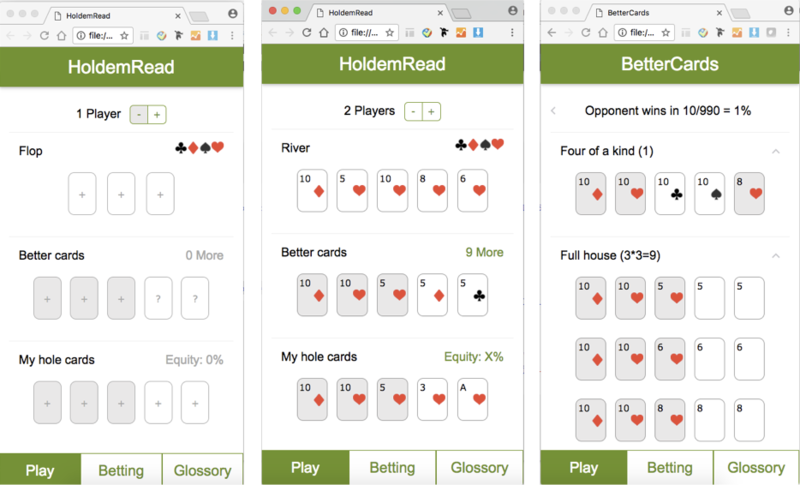 We want to help Texas Holdem players to read their cards more comprehensively, meaning knowing their probability to win as well as knowing other players’ possible better cards, which is not achieved by any of the existing apps. Now that we know the real problem, I started to design the structure of the app. As a entry-level player, I sort of asked myself what should be put there. It should have “Play” for adding/viewing cards information; “Betting” for suggestions based on actual equity; and “Glossory” aiming at introducing terminologies to learners. See below for initial draft. 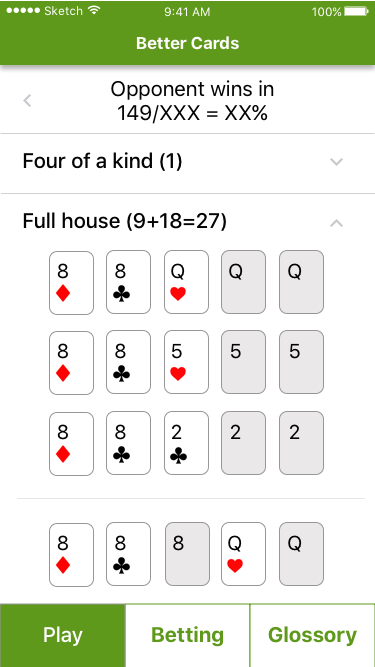 Z likes this strcuture as well (he is a mid-level Texas Holdem player). We plan to focus on Play session design and user test this structure after we came up with a web prototype. Based on option 2, I went through several iterations to achieve a design that emphasizes the main feature and covers all possible outputs. I also added color theme. 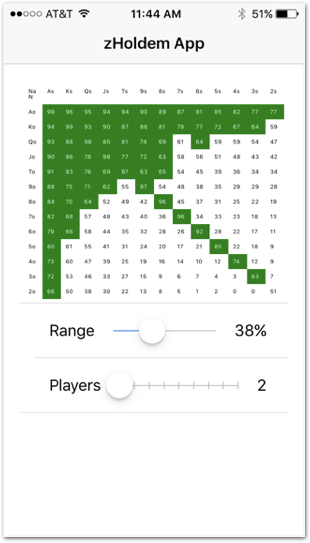 At the same time, Z implemented the algorithm that generate better card sets based on user inputs. All of these work are just for the main function "Play". We will expand and iterate on adding more features after an initial user test. Based on the design above, I created a prototype using HTML/CSS (see below). Notice that I have changed some cards' background colors to indicate the cards are unchangable. Z is currently looking at connecting the web page with the algorithm at this moment. After this, I'm planning to conduct user research on the "Play" main feature as well as the app structure. My role in this project is designer, front-end prototyper and PM. We started this side project in January 2017.